Home / hp proliant ml10 / MSE / pc / server / HPE ProLiant ML10 Gen9 Tower Server, a compact size server perfect for small business. 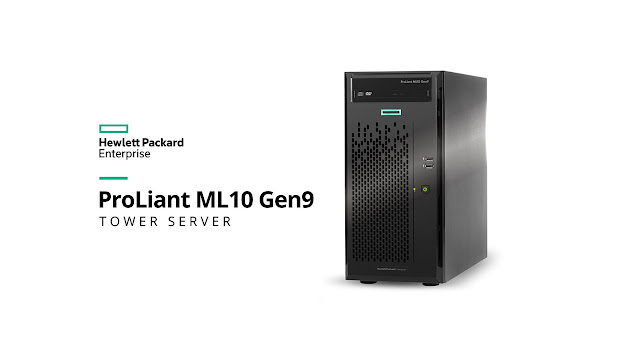 HPE ProLiant ML10 Gen9 Tower Server, a compact size server perfect for small business. Planning to have a new or replace your old server? you might consider the ProLiant ML10 Gen 9 Tower Server by HP Enterprise. It's packed with performance and reliability for your valuable data, this server might just be the entry-level server solution you’re looking for. The ML10Gen9 Server offers server level performance in a quiet and compact size that makes for an easy deployment perfect for SOHO. it will make you replace your current workstation solutions to your first server. Its expandability allows required workloads to be delivered and its performance helps prevent potential data loss at affordable price. It’s simply the right choice for your first server. The HPE ProLiant ML10 Gen9 Server offers the right server technology for SOHO businesses looking for performance and features at an affordable price. Its embedded with Intel® AMT Management module with remote console, Web browser GUI and remote power on/off. The ProLiant ML10 Gen9 Server offers expandability with internal support for up to six Large Form Factor (LFF) disk drives and increased I/O expansion. Configured with the UEFI boot mode allows provisioning both locally and remotely with either Intelligent Provisioning or Scripting Toolkits. It supports the Intel Xeon® E3-1200 v5 processor in a 4U chassis offering increased performance and efficiency. Server class technology allows for 24x7 business operation, offering higher reliability and longer life cycle. for full specs of HPE ML10 Gen9 tower server click here. Upgrading soon? Contact the exclusive distributor for HPE Proliant ML10 Gen9 in the Philippines, MSI-ECS, at (02) 688-3512 or email them at inquiry@msi-ecs.com.ph.